I am driving to Cedar Rapids, Iowa tomorrow morning. the town I fled in 1979. My last trip there was in 2001, to bury my niece Jenny. She was found dead at age 27 and buried the week before 9/11. I will visit her sister and brother, whom I spent a lot of time with when we were all younger. Following college and several of the usual crack-ups that attend life, I moved to Minneapolis. I have been here since. I have visited Cedar Rapids several times, the occasion, as often as not, being a death. Each visit I have had another grave to sit at- my mother’s, Jenny’s, buried without design about 300 feet apart. My father died in 1975, age 51, but is buried in the veteran’s cemetery of Springfield, Missouri, probably a pilgrimage too far this go round. 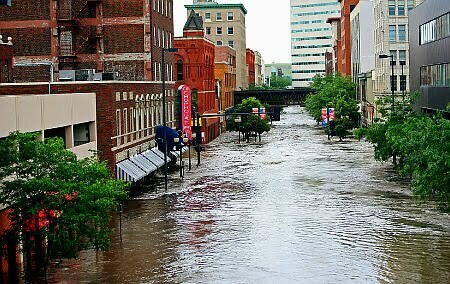 In June 2008, the Cedar River, which bisects the town, crested at 31 feet, flooding 10 square miles of Cedar Rapids; this resulted in several thousand of its 130,000 residents being displaced or homeless. There are still hundreds of FEMA trailers in devastated neighborhoods. 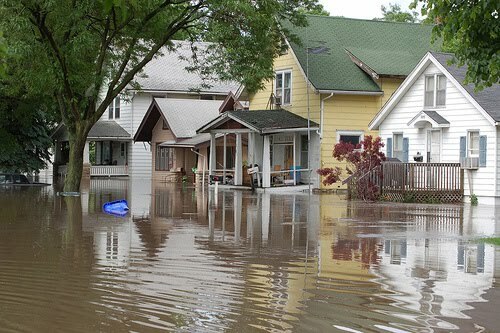 1,500 properties were scheduled for demolition. 2.5 billion dollars of infrastructure damage and 1,500 lost jobs later, I am visiting my remaining family. It was past surreal seeing the town where I ripped and ran for two decades getting the CNN crisis-of-the-week play. My antipathy for the town is long past, tied to my misspent youth there. I plan also to see two men, each 88 years old, who are part of that past. One is my ex-father-in-law, whom I met in 1978, now living in an assisted-living home. The other is the bandleader who employed my wild father, a gifted, self-destructive guitarist, in his working band for about 15 years. If for no other reason, he should be granted sainthood for shepherding that band, a sextet that lived on a tour bus much of my youth, through the usual alcohol-fueled, skirt-chasing, divorce-wracked hijinks. The stories he can tell are legion; I called him, after not talking to him for 40 years, and asked if he’d share a cup of coffee with me. He said yes without missing a beat. He lost his wife some years back. He is the only person alive I have contact with who knew my father. The real practice of what is called zen is little more [what can you add?] than being fully present to what’s happening here and now. I have spent several nights this week, for the first time in many years, sifting through shoe boxes of photos of my nieces, living and dead, my nephew, my sons, my mother and father. Breathing in Cedar Rapids, which is, of course, memories of Cedar Rapids. This is what Chogyam Trungpa Rinpoche called nostalgia for samsara. Nothing wrong with going home again, viewed in that light. Nostalgia for samsara means a longing, even an orientation, for that peculiar sorrow that is an admixture of recalling painful experiences, and missing good experiences. In sum, everything but this moment, here and now. So, I’m setting out to visit a couple of old men, surely for the last time, touch a few graves, and look, for the thousandth time, on Cedar Rapids. Maybe I will see it. This entry was posted in non-music writing on June 11, 2010 by jessewgoin. Thanks for sharing this Jesse. Travel safely. See you soon.